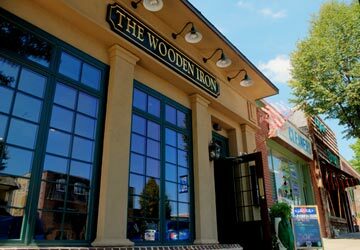 Many Main Liners were scratching their heads this weekend as the Wooden Iron quietly closed forever after seven very successful years as one of Wayne’s most formidable restaurants. The “Iron” opened its doors in November of 2001 with its upscale, country club themed interior and expansive bar and quickly gained a steady crowd of Main Line martini-loving beautiful people. I had my first cosmopolitan at the Wooden Iron New Year’s Eve 2002 and have fond memories of the fabulous food and entertaining crowds that filled the bar on Friday nights. But the good news is…in about a week the Iron will reopen as Flanigan’s Boathouse (www.flanboathouse.com). Some of the owners of the Iron are part of the Flanigan’s family so the speedy transition makes a lot of sense. And, AML’s staff is thrilled to have the famous selection of Flanigan’s wings just around the corner. There’s no doubt the new Flanigan’s Boathouse in Wayne will be packed for those Birds games and many a Main Liner will fill the refurbished bar to watch the Phils make their way to the World Series! I liked the Iron but Boathouse makes a lot more sense. amount of time. Why the big hurry?